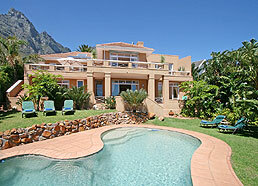 Mssangasanga is a lovely modern double storey villa facing the Atlantic Ocean and Lion’s Head in Camps Bay. The décor through out the whole villa is neutral tones, which just adds to the ambiance of space and tranquility and utter comfort. The living area incorporates a comfortable lounge, dining room and fully equipped kitchen. The ground floor has 2 twin bedded rooms with 2 bathrooms en suite, lounge combined dining room and another open plan kitchen, all leading out onto the patio, lush gardens and private pool. With the choice of the spacious balcony upstairs with wooden table, chairs and large umbrella and the patio with swimming pool on the ground level, this villa is ideal for entertaining a large family or a group of friends.